Heat the oil in a pot over medium heat. Sauté the onion and garlic until they’re soft, but not browned. Add the yellow ají (if you’re using it) and stir well. Add the rice and cook for 5 minutes. Pour wine over the rice, stir well and let reduce. When it’s almost dry, incorporate the carrots and the pepper then start adding the broth by the spoon full. Make sure to stir constantly. When broth evaporates, add more and continue until the rice has cooked al dente, about 20 minutes. Season with salt and pepper and add the corn and green peas. Finally, add the cilantro and the scallops, stir, cover and turn off the stove. Let the scallops cook in the heat of the rice for 5 minutes. Add more cilantro, if you like, and serve immediately with lemon slices. If you want, add raw shrimp and calamari during the last three minutes of the cooking time. Cant find Arborio rice? Use carnaroli in its place. 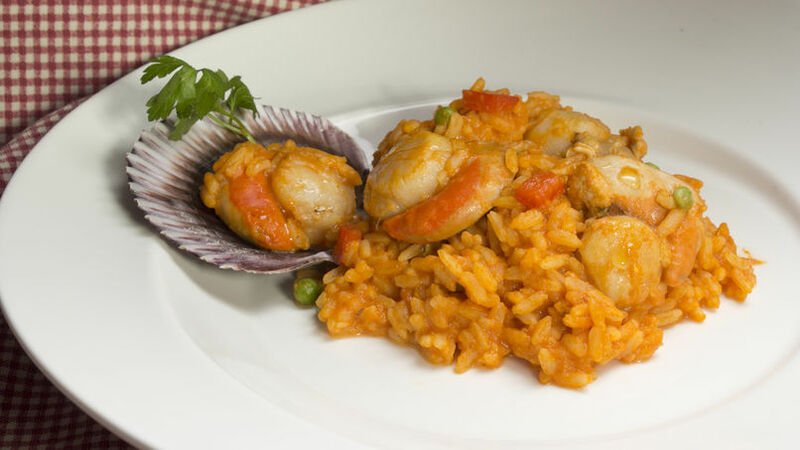 Among the many rice recipes I call my favorites, rice with scallops have always been at the top of my list for a long time. Not only is it a colorful dish, but also it’s so good you may not be able to stop yourself from serving more portions for yourself. The traditional recipe is made with white precooked rice, saving time in the kitchen, but I also like to vary the recipe a bit by making it with risotto. It’s all the same ingredients and flavors, but the end result is different and creamy. If you like looking for new ways to make different kinds of rice, then I definitely recommend putting this recipe to use. If you’re not a fan of seafood, simply omit the scallops and use more vegetables (artichokes, asparagus and green beans) and cook everything in a tasty vegetable broth. Use this rice as a side to meat or as a vegetarian main dish. Sprinkle with parmesan cheese and you’ll have a delicious dish! The scallops – I cannot repeat this enough – should be as fresh as possible. Add them when the rice is ready to avoid overcooking them. If they’re overcooked they will be dry and elastic, but they should be juicy so that you can enjoy they’re amazing flavor and delicious texture. One last secret? Serve as soon as it’s ready, this is one of those dishes that waits for no one and will be much better when it’s fresh. Enjoy!